The baby shark song videos have been all the rage, and we’ll show you why that’s not such a bad thing. That’s right! Listening to Baby Shark (doo doo doo doo doo doo) is actually doing amazing things in your child’s brain! As a child sings, dances, and plays instruments, research indicates that they are building pathways in the brain that will benefit them for a lifetime. Through that magical world of play, our little ones begin to learn and assimilate information about themselves and the world. Providing a rich and varied musical environment for a child not only enhances their musical tastes and exploration, these playful, engaging musical experiences can facilitate life-changing skill acquisition. You can read more about this in our post on how music makes children smarter. Did you know that the Baby Shark song only has 17 words? As annoying as the repetition might be to us as adults, the simple and predictable nature of this song makes it perfect for young learners. We all know the frustration of not being able to think of the words to a song – kids feel that too! However, if they can say “doo,” or anything close to “doo,” they can sing practically the entire baby shark song by themselves! This gives a jolt of confidence and pride and helps foster a love of learning. The simple vocabulary used in the song can also be a great learning tool. Use the song as a starting point to talk about family, which can lead into other awesome preschool themes like grandparents, Thanksgiving, or All About me. Or you can tie the song into swimming, fishing, the ocean, and summer. The possibilities are endless! So gear up! Get ready to sing and dance along! It’s every version of the Baby Shark song you could ever want! 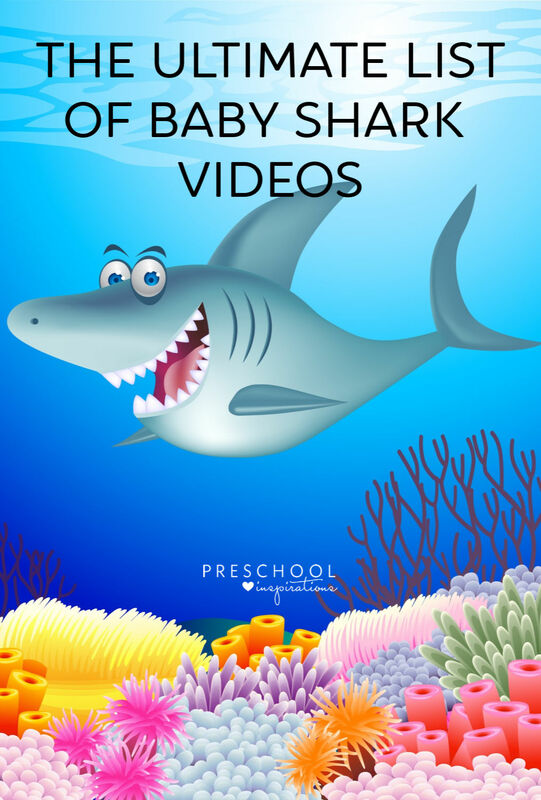 We found the best Baby Shark song YouTube videos and made them easy for you to scroll through our favorites for kids. Pinkfong is an animated pink fox character and subsequent brand that’s the brainchild of SmartStudy, a South Korean educational entertainment company. While they definitely popularized the Baby Shark song, they technically didn’t create it. What’s the real baby shark song origin? It’s been around a while as a “campfire song,” one of those catchy tunes that everyone knows and no one really knows who wrote. Our friends from The Learning Station included it on an album in 2011. I remember singing it at library story times with my own kids long before it was the craze it is today! However – this 2016 YouTube video was the spark that caught fire! The video has BILLIONS of views! Pingfong and all our other educational video friends have capitalized on the craze and made these adorable seasonal versions of Baby Shark. Here’s the best for Valentine’s Day, Halloween, Christmas, and Winter! Keep your eye out on YouTube, these seasonal versions are really picking up steam lately and I bet some more will be released soon. In late 2018 #babysharkchallenge took off as a social video craze. It included lots of people doing a Baby Shark dance alongside moving cars, which we definitely don’t recommend, but a ton of other fun videos and applications came out of it! Get your Zumba on with Baby Shark! Get this: Baby Shark is sung at a tempo of 110 beats per minute, which is exactly the same speed at which you should do CPR! Some health professionals suggest that keeping it in your head while in a crisis could actually save a life! Does it count as a workout if my abs burn just watching them?? One last one. 🙂 Even celebrities can’t withstand the draw of Baby Shark. This version is, of course, appropriate for kids, but they might not appreciate them as much as you do! Need some songs to get Baby Shark song out of your head now?? Check out our other songs for kids!